The establishment of the Museum of world Buddhism, associated with the Temple of the sacred Tooth Relic of the Buddha, constitutes a most adorable exercise in the context of World Buddhism. We are most grateful to his Excellency Mahinda Rajapaksha. 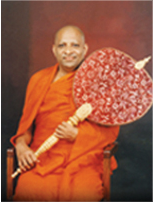 President of the Democratic socialist Republic of Sri Lanka, for his gracious act of allocating the site to Diyawadana Nilame has performed a marvelous task in organizing the Museum in a fairly short period with the collaboration of world Buddhist. I take this opportunity to offer my blessings to all national and international government, bodies and individuals who provided their unstinted effort and knowledge to achieve great success of this noble venture, thus enabling world Buddhists to enlighten themselves on the Buddhist heritage of the world at the most worthy site, the Sri Dalada Maligawa complex.